The cost of a web site varies depending on what a client wants on their site.. The price goes up with the addition of more pictures, dynamic enhancements, and more text. when they ask about the cost. Once the site has been designed and approved, it needs to be mounted on a web server. are for client-requested changes to the site. People viewing web pages now want more than static pictures and text. that can be incorporated into your web site to enhance it's appeal to viewers. the presentation of your business. a whole host of options to support additional features to your site. on the back end as well (what kind of use your site is getting). 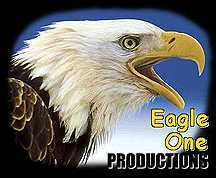 Eagle One Productions has developed a number of complete web sites for clients. To check on the list and see what we've done, just click HERE! to give us a call or drop us a line.